The Barakar River is the main tributary of the Damodar River in eastern India. Originating near Padma in Hazaribagh district of Jharkhand it flows for 225 kilometres (140 mi) across the northern part of the Chota Nagpur Plateau, mostly in a west to east direction, before joining the Damodar near Dishergarh in Asansol, Bardhaman district of West Bengal. It has a catchment area of 6,159 square kilometres (2,378 sq mi). The main tributaries, Barsoti and Usri, flow in from the south and north respectively. Apart from the two main tributaries some fifteen medium or small streams join it. The Barakar skirts the northern portion of Parasnath Hills, 1,350 metres (4,430 ft) above sea level, the highest hill in the region, located in Giridih district of Jharkhand and a centre of Jain pilgrimage. The river flows in all fury during the rains in its upper reaches and has washed away two bridges constructed successively on the Grand Trunk Road. The great stone bridge across the river near Barhi, in Hazaribagh district, built around 1848, was washed away in 1913, after a fall of 250 millimetres (10 in) of rain in 24 hours. The narrow iron bridge, which was built to replace it, withstood the strains of troop movement during the Second World War, but gave way in 1946, with another great flood. A new bridge built in the 1950s has withstood the fury of the river. There is another bridge on the Grand Trunk Road, across the Barakar, connecting Barakar a neighbourhood in Asansol having the same name, in Bardhaman district of West Bengal with Chirkunda in Jharkhand. With heavy traffic in the heart of the coal belt, the bridge built in the mid-19th century is in need of repairs. A new bridge has been built, to the north, on the bypass running from Kalipahari in Asansol to Nirsa in Dhanbad district. The huge volume of monsoon water was carried down the valley and formerly created havoc with floods in the lower Damodar basin. Annual rainfall over the basin varies between 765 and 1,607 millimetres (30.1 and 63.3 in) with an average of 1,200 millimetres (47 in) of which 80 percent occurs during the monsoon season from June to September. 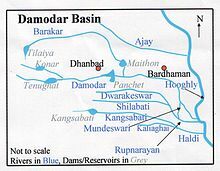 In order to harness the river (along with the Damodar), the Damodar Valley Corporation (DVC) planned and implemented independent India's first multipurpose river valley project. The first dam of the project was constructed across the Barakar at Tilayia. DVC's first dam, Tilaiya Dam, was across the Barakar at Tilaiya, in Hazaribagh district of Bihar, now in Koderma district of Jharkhand. It was inaugurated on 21 February 1953. The dam is 366 meters (1,201 ft) long and is 30.18 meters (99.0 ft) high from the river bed level. Tilaiya hydel power station is located on the left bank of the river Barakar. The structure is entirely of reinforced concrete. It has two generating units of 2 MW each with a provision for a third future unit of the same capacity. DVC's second dam was across the Konar, a tributary of the Damodar, in Hazaribagh district, and the third was across the Barakar at Maithon in Dhanbad district of Bihar, now Jharkhand. The river forms the boundary between West Bengal and Jharkhand in that area. The dam was inaugurated on 27 September 1957. The dam (both concrete and earthen) is 4,860 meters (15,940 ft) long and the concrete dam is 43.89 meters (144.0 ft) high above the river bed level. The unique feature of Maithon is that the hydel power station is located underground in the left bank of the river (on the West Bengal side) and is the first of its kind in India. The Power Station has a total generating capacity of 60 MW with three units of 20 MW each. About 13 kilometres (8 mi) downstream from Maithon, the Barakar joins the Damodar at Dishergarh. Maithon Dam is 48 kilometres (30 mi) from Dhanbad and around 25 kilometres (16 mi) from Asansol. Other neighbourhood and suburbs in Asansol namely Rupnarainpur, Chittaranjan and Kulti-Barakar-Neamatpur-Dishergarh lie still nearer. It receives a steady and daily stream of tourists. In order to augment the meagre hydroelectric power generation DVC has gone in for both gas turbine and thermal power generation. While most of its facilities for such generation lie in the Damodar region, Maithon in the Barakar regions is a major focal point. Maithon Gas Turbine Station was commissioned at Maithon in 1989. The station has an installed capacity of 82.5 MW with three units each of 27.5 MW capacity. The 2 X 500 MW Maithon Right Bank thermal power station is under implementation. It is a joint venture of Tata Power and DVC. A 2 X 500 MW greenfield thermal power station has been proposed for Koderma. DVC is working on the proposal for a third dam across the Barakar at Balpahari in Jharkhand. Planned as part of its network of dams and barrages in the valley region, the Balpahari project was conceived with the objective of reducing siltation problems at Maithon, increasing the reach of canal irrigation and adding to hydro-electric generation capacity by 20 MW from the existing 144 MW. After the construction of the four dams at Tilayia, Konar, Maithon and Panchet by DVC, it was observed that the rate of silt inflow into the reservoirs were much higher than what was anticipated earlier. It threatened the longevity of the reservoirs. The catchment area of these reservoirs spread over the undulating terrain of the Chota Nagpur plateau is seriously affected by soil erosion. Large volumes of silt in the form of coarse and fine sediment is removed from the area by erosion under the impact of the water flow caused by torrential rain, which runs down the numerous stream channels during the monsoon. Thus the problem of reservoir siltation assumed great importance in the case of DVC. In order to prolong the life of the reservoirs, there was need for soil conservation and silt control. DVC set up a Soil Conservation Department at Hazaribagh to tackle the twin problems of reservoir siltation and soil deterioration in 1949. The reservoirs at Tilaiya and Maithon, provided scope for development of fisheries. Efforts were made to introduce carp once the water accumulated behind the dams but the results have not been commensurate with the efforts, largely due to the formidable presence of predatory catfish Wallago attu and other predators such as Notopterus chitala and Barilius bola at Tilaiya, and catfishes Wallago attu and Aorichthys aor, at Maithon. These predators take a heavy toll of the stocked carps. Trash and uneconomic fishes form dense populations at Tilaiya reservoir, competing with major carps for food. The composition of catch at both the places is: catla, mrigal, rohita and calbasu. ^ Houlton, Sir John, Bihar the Heart of India, 1949, p117, Orient Longmans Ltd.
^ "Damodar Valley". Ministry of Environments and Forests. Archived from the original on 2007-09-27. Retrieved 2007-02-14. ^ a b c d e "Damodar Valley Corporation". Damodar Valley Corporation. Archived from the original on 2007-02-10. Retrieved 2007-02-14. ^ "Tata Power signs generation pact with DVC on Maithon project" (Press release). Tata Power. Archived from the original on 30 December 2006. Retrieved 2007-02-14. ^ Bose, Pratim Ranjan (26 May 2005). "Damodar Valley to undertake dam project in Jharkhand". Business. The Hindu Business Line. Retrieved 2007-02-14. ^ "Soil Conservation". Damodar Valley Corporation. Retrieved 2007-02-14. ^ "Fisheries". Archived from the original on 29 January 2007. Retrieved 2007-02-14. This page was last edited on 25 November 2018, at 22:43 (UTC).